This months Daring Bakers challenge was a Danish braid and I was really looking forward to making it. The Danish braid is made with Danish pastry dough which is made by folding dough with butter into many layers. The Danish dough should bake up nice and light and buttery and flaky. I had been wanting to try making a multi-layer dough that puffed up when cooked for a while. As coincidence would have it I had also recently bookmarked a cheese danish recipe that I had wanted to try. One thing that I really liked about this challenge was that we were allowed to choose the filling. Since strawberries were in the peak of their season I could not pass up on the chance to use some fresh strawberries. I had just made some strawberry and rhubarb jam and I though that it would go well in the braid as well. Since I still had the cheese danish on my mind I also decided to add some cream cheese. In the end it turned out to be a strawberry Danish braid with cream cheese and strawberry and rhubarb jam. As with most Daring Bakers challenges the Danish braid was no walk in the park. There are a lot of steps and it took a lot of time. I was hoping to get the whole thing done on one day of the weekend but I ran out of time and had to finish it the next day. Overall each step was pretty easy though. The only problem that I had with the recipe was that it said that while folding the dough that you roll it out to a particular size each time but then after letting it sit in the fridge over night you were supposed to be able to roll out the same dough to over double the size that you were rolling it to the day before. My dough rolled out to the same size as it did the day before and I rolled it a bit thinned so that I could have some extra to make some cheese danish. Maybe the yeast was supposed to have more than doubled the size of the dough while it was in the fridge? Maybe my yeast was not as active as it could be? The dough did expand while proofing before baking… The Danish braid baked up well, though I could have pulled it out of the oven a minute sooner. In the end I was really pleased with both the Danish braid and the cheese Danish! They were both really good! The Danish pastry was nice and light and flaky and buttery and good. In the pictures you can see the layers and that it puffed up nicely. The pastry itself was full of flavour from the vanilla and the cardamom. The cream cheese and strawberry and rhubarb jam and fresh strawberry filling was perfect. 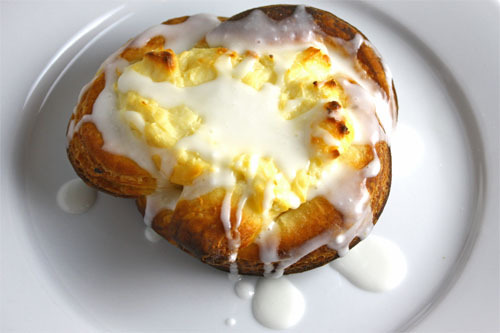 I enjoyed both the Danish braid and the cheese Danish for breakfast last week and they both disappeared quite quickly! I am really glad that I got to make the Danish pastry and I look forward to making it again. Whisk the yeast into the milk in a bowl. Add sugar, orange zest, cardamom, vanilla extract, vanilla bean seeds, eggs, and orange juice and mix. Sift the flour and salt onto your working surface and form a bowl. Pour the liquid into the middle of the bowl. With your hands, mix the flour into the liquid starting from the inside and working out until combined. Knead the dough until it becomes smooth and easy to work with, about 5-7 minutes. Pulse the butter and flour in a food processor until combined. Let the butter sit at room temperature until the dough is ready. Roll the dough out to about 18×13 inches and about 1/4 inch thick. Spread the butter over the right and center thirds of the dough. Fold the left third of the dough over the center followed by the right third and chill in the fridge for 30 minutes. Place the dough on the work surface lengthwise with the open ends on your left and right. Repeat steps 12-13 until for a total of five times. Chill in the fridge overnight or for a minimum of five hours. Slice the left and right thirds of the dough at an angle and parallel to the other side into 1 inch wide slices. Spread the filling on the middle of the dough. 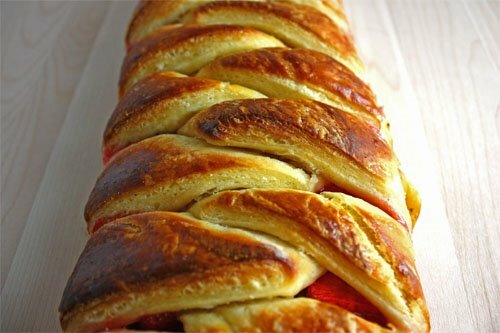 Fold the slices of dough from the left and right sides of the middle, alternating and forming a braid. Fold the top and bottom flaps over to hold in the filling. Let the dough sit at room temperature for 2 hours. Brush the egg onto the top of the dough. Bake in a preheated 350F/180C oven until golden brown, about 25-30 minutes. Take a look at the other Daring Bakers danish braid creations. omg kevin!! that looks so good. I love how the danishes are nicely browned. 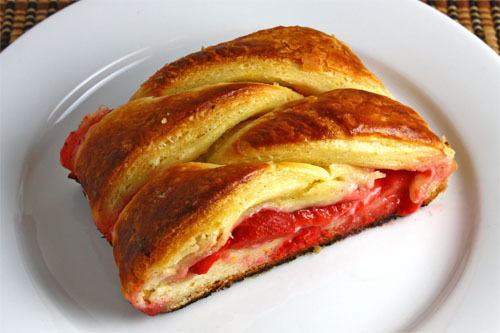 The filling combination of strawberry + cream cheese is also really nice.. sweet and rich! oooooo looks fantastic, can almost taste the sweet strawberries and the creamy cream cheese!!! Your braid and pastries look just delicious! Looks heavenly Kevin and the filling makes me drool worthy.Great work. I certainly pondered the idea of cream cheese and strawberry jam. Sounds and looks terrific! Kevin, your danish bread is fantastic-looking – love your choice of filling! Kevin, your repertoire continues to expand with more and more successes! The braid is just lovely – all of those fresh strawberries… mmmmm! I like that little cheese danish too, so CUTE! So far this strawberry one is my fave. Kevin, I don’t think the proofing is an issue– the braid looks quite perfect as it is. Don’t worry about it 😉 You are on a strawberry high, I love it 🙂 I don’t think I could ever make a laminated dough in this weather, though. Yes, I liked the fact that we could fill it with whatever we wanted to. I love the strawberry filling – looks great Kevin! That looks like it come from a lovely bakery!! You ARE a bag of chips and more!!!!! Despite your troubles with rolling the dough – it looks terrific! Wow! Yours looks much better than mine! Mine was impossible to roll out, I think it was too dry, or I kneaded it too long. ok now see if we were making the danish together we would have had the perfect doneness. the filling looks and sounds wonderful. I loved this DB challenge so much for the same reasons you did. Yet another fantastic use of strawberries. Lovely pictures. Sweet Jesus that looks great! The pictures are fantastic, and now my mouth is watering…. I’m lovin that cheese danish! You did a great job Kevin! That is absolutely gorgeous, and what everyone else said 🙂 I think you took it out at exactly the right moment … btw, I have added a link to your blog so I can keep up with your wonderful culinary creations. I love the pictures Kevin you are such a great cook! It looks fabulous. Kevin I love your dough! The braid is great but that cheese danish, it’s just amazing with the icing coming down the sides, wow! Beautiful and delicious..I wouldnt expect to see anything less when I visit your blog!!!!Bravo! Oh they look so good! I thought cream cheese was the yummiest in it. Oh, goodness! I actually gasped when your page loaded–your braid is GORGEOUS! Terriffic job! Beautiful braid, Kevin! I love the filling flavors you picked. How can you go wrong with cream cheese, strawberries, and rhubarb? wow Kevin, the filling sounds amazing. And that last pic of the danish. Wow it looks like a work of art. Oh to sink my teeth into that! Looks great Kevin! I chose strawberries for the same reason! Your danish looks really good – and fresh strawberries? Yum! Beautiful as always Kevin! And the filling is fantastic! I am going to have to redo this recipe using your filling ideas before strawberries completely go out of season! Those are such great pics Kevin. The danish recipe itself looks amazing – seriously. Have a great Canada Day. Your braid and pastries look fantastic! Great job!! This looks fantastic! I love your recipes. I saw so many of the DB posts today… don’t know how u guys do it! Nice work. Nice work! I think the braids look great and I thought about adding cream cheese to my strawberry rhubarb but I did not have any. After looking at yours, I might have to make this again soon! It’s so smart to use what you already have on hand! Nice! it looks totally perfect. good job. Wow-looks gorgeous. I did strawberry and cream cheese too so I know it’s yummy. love the strawberry rhubarb cream cheese filling you chose! yum! looks like it puffed up nicely, well cone! this looks so pro! very ambitious…as daring bakers suggests. good job to you. Really beautiful, tempting and delicious looking! I love the filling you used! Great job here! The cheese one has me drooling! omg this sounds really tough to make but you pull it off nicely. Looks sooo heavenly! Beautiful danish, Kevin! They look totally droolworthy! Great job! your braid and pastries look amazing, your did a great job! I think your braid looks really beautiful. I didn’t get to make mine this month which I am gutted about but at least I can drool over everyone elses! I love the strawberry combo you chose. Yum!! I thought the baking times were off, too – I took mine out at 20 minutes! This looks so perfect. The color and the glaze looks fantastic. I have seen those all over the place and I think yours is the best looking one! gorgeous! Both danish varieties you made look great Kevin! Great looking braid! I wish I had been more adventurous with the filling. That strawberry filling looks delicious! I did strawberry cream cheese as well..wasn’t it fantastic? Beautiful images, as usual Kevin! They looks so good. Thanks for inspiring me to join the Daring Bakers… I did my first challenge this month and had a blast! I love how you kept extra sauce for the individual slice. Good thinking! The braiding is so fancy. I would not do well making this. Looks great Kevin! The strawberry filling sounds amazing! I had similar problems rolling the dough on day two… the required size just wasn’t going to happen unless I rolled it nearly paper thin. Yours looks great; your cheese danish had me yearning to lick the screen. Looks phenomenal!! I daydreamed about using strawberries, but they’ve passed their time at my market. The strawberry one looks great, but I cannot get that cheese danish out of my mind! Gosh, that’s a perfect braid! Kevin you did a fantastic job on the braid and the filling sounds divine! What a challenege! Well done. I wanted to mix mango with starberries but I didn’t think it would make a good combo. So for my 2nd braid, I made it with chopped mangos mixed with some little sugar. It turned out fantastic with vanilla bean sugar free ice cream! Gorgeous braid, Kevin–it looks perfect! That is a most beautifully made braid. I used the suggested apple filling but used mango and coconut in my little ones. Wow, you’re doing better and better everytime. I really like your danish braid. I’ll have to try to make one some day. I’m with you on it being done before time was up. Your bread looks fantastic! this looks great! Very interesting – I have never tried anything like this but it looks like a challenge. It came out so good though. Yours is the first strawberry rhubarb one I’ve seen. I knew it would look beautiful and it does! That looks divine!!!! Fantastic job, doesn’t look as if it were to terrible a challenge at all!!! Your braid is amazingly beautiful! Great job. Strawberry cream cheese sounds delicious! Looks beautiful, as always. I should steal some of that delicious looking strawberry rhubarb jam from you!!.. Your braids look amazing.. CONGRATULATIONS on your challenge!! OH wow, that danish braid looks amazing! LOVE the strawberry/cream cheese filling…makes me want to make it again! Fabulous job Kevin! That last danish is just screaming to be eaten! How did you braid cheese danish(cream cheese in the middle)?